Google’s reboot of its much-hyped augmented reality headset takes the device in an important new direction. Through targeted projects with “Glass Partners,” Glass EE is poised to find important applications in healthcare. Google Glass Explorer was announced to the public with much hype in April 2012 by Google co-founder Sergey Brin. Many speculated that Glass and the new class of devices it would subsequently create would be the next evolution in personal computing. In the original product announcement video, Google presented a vision of the future in which Glass would merge the physical world around you with your smartphone, placing navigation, emails, and social media literally within eyeshot through the use of augmented reality. Google Glass Explorer was initially received with much excitement, however, the device was buggy and with a price tag of $1,500, too expensive for widespread adoption. Price and technology issues aside, Glass also entered a market that was not yet ready for such a novel technology. Privacy and security concerns were foremost, as many were uncomfortable with the notion of Glass recording them without permission. Lawmakers were never able to reach a consensus regarding whether Glass should be considered a recording device that would be banned from certain public establishments or a potentially obstructive monitor that would be prohibited from use while driving. Google officially discontinued Google Glass Explorer in 2015. While Glass’ departure came with a somewhat generic “We’ll be back soon!” statement, it still took many by surprise in July 2017 when Google announced a new version of its wearable known as “Google Glass Enterprise Edition” (Glass EE). So what’s different about Google Glass EE, and has Google learned from the mistakes of its past? On the technology side of things, Glass EE is still an optical, head-mounted computer with a transparent display that brings information into your line of sight. However, the form factor has been completely redesigned to optimize the way it folds, charges, and even resists sweat. 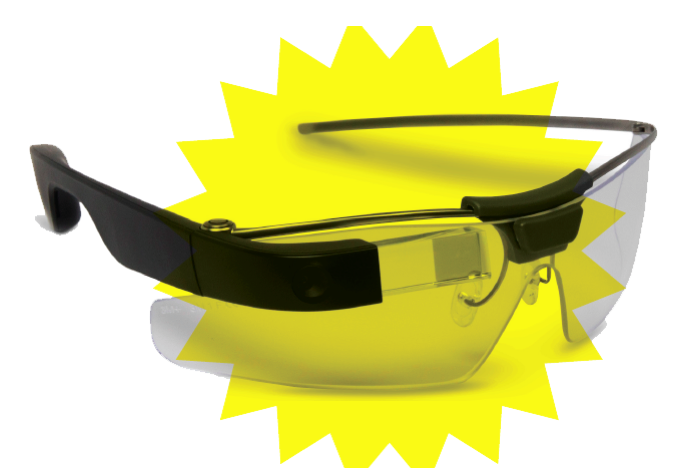 Most notably, Glass EE can be clipped onto a pair of glasses or any type of industry frames, such as safety goggles. Glass EE also incorporates upgraded electronics that make it faster and more reliable, as well as more secure. Moreover, battery life has been increased and the camera has been upgraded. And for those with privacy concerns, Glass EE has a green light that turns on when a video is being recorded. Technology upgrades aside, Google has taken a more restrained marketing approach this time, launching Glass EE in a market that is a little more primed for change: the workplace. At the time of writing, Glass EE is only available through a dozen companies that Google calls “Glass Partners.” Consisting primarily of manufacturing, logistics, and healthcare companies, these Glass Partners have already been using Glass EE for a couple years, all with statistical evidence to support how Glass EE has helped them work faster and more efficiently. And there are no smartphone notifications and no tweeting; Glass EE can only run the single application that its Glass Partner has developed. Only time will tell whether or not Google Glass will find its way back into the consumer space. But until then, enterprise users should be excited that they’ll be at the forefront of technology this time around with a device specifically designed to make their jobs easier.